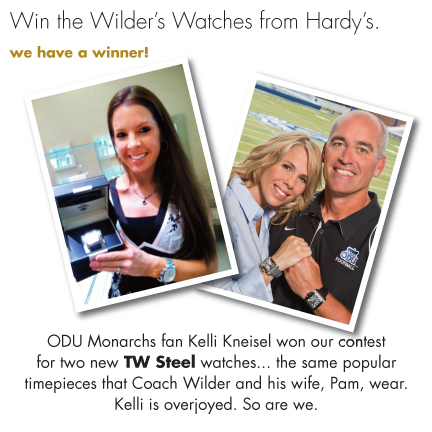 Hardy’s and ODU Football : We have a Winner for the Wilder’s Watches! No purchase necessary to enter or win. A purchase does not increase your chance of winning. Void where prohibited. Contest open to persons at least 18 years of age and is open only to residents of the United States residing in the 50 United States and District of Columbia (excluding Puerto Rico and all other territories). Limit one (1) entry per person per e-mail address per week. Drawing for Wilder’s Watches will be April 14, 2013. Prize will be awarded only upon winner redemption, confirmation, verification, and final approval by sponsor. No substitution, transfer of prize or cash alternative permitted, except by sponsor who reserves the right, in its sole discretion, to substituted a prize of equal or great value, if prize, or portion of prize becomes unavailable. All federal, state, local and other taxes on prizes are the sole responsibility of the applicable winner.